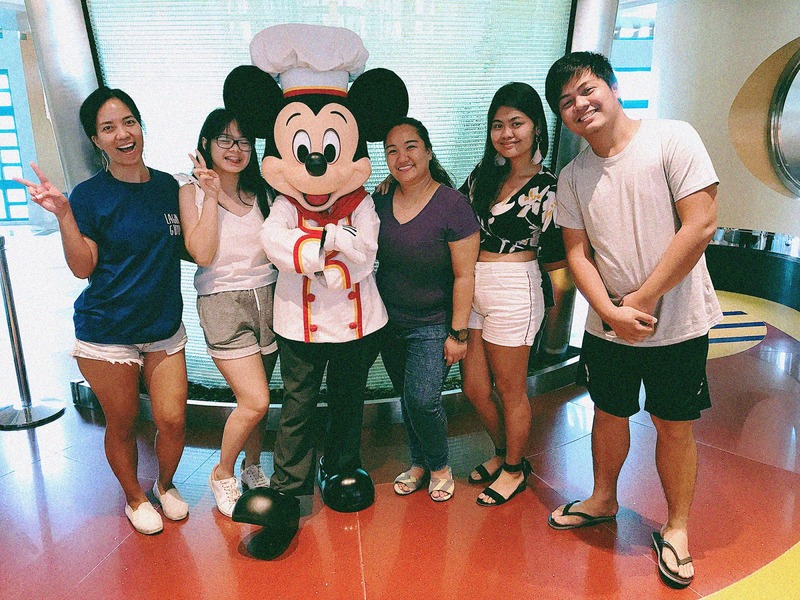 For our last two days in Hong Kong, my family and I made the trip back to Lantau Island to spend a night in Disney's Hollywood Hotel and enjoy a day in Hong Kong Disneyland. It was perfect because not only were we now closer to the airport, but we also get to close our trip where the magic happens. Magic, it did. Staying in one of the three Disney hotels in that area was already a trip on its own. Each hotel has a theme that is followed in design to a T. There's the Disney Explorers Lodge, which looked like an adventure from the outside, the Disneyland Hotel, which had a romantic, Victorian inspired look, and the hotel we stayed at, Disney's Hollywood Hotel. Disney's Hollywood Hotel is exactly what its name suggests - a piano-shaped outdoor pool, decors propped up to make corners look like a movie set, a diner designed to look like a theatre, and their own Hollywood sign as the backdrop of the reception. But the star of the show is, of course, Chef Mickey. He does his meetups at the Chef Mickey restaurant, the main dining area of the hotel. You'll have the chance to meet him while you enjoy your breakfast, lunch, or dinner. Once seated, each table is given a card that allows you to queue up for a photo-op. There will be an official photographer; however, you can ask them to take your photo using your phone as well. When it came down to the rooms, it did not disappoint. In true Disney fashion, there were hidden and not-so-hidden Mickeys everywhere! My Disney heart was happy to see that it was all very detailed and they've kept everything in theme. Apart from the appearance, the room was very comfortable. The beds were soft, bathrooms fully equipped with shower, tub, and bathroom essentials, a TV that shows Disney channels, and a beautiful view of the pool and outdoor area. We also got a good look at the sea, and what a dream it was at sunrise! Other amenities include a pool, a mini arcade, a playground, and of course, a bus that takes you direct to Disneyland and back. Also important to mention that almost everything is a souvenir (even our room key cards, which had an Iron Man design on it). We did our Disneyland trip on the first day, which I will share in a separate blog post. But the next morning, I took my time to walk around and explore a bit. If you ever find yourself staying there, walk around the vicinity. It's definitely worth the couple of minutes. I also found out that you can get a glimpse of the other Disney hotels from the backyard or seaside pathway. Maybe I'm overhyping it, maybe I'm not. But for someone who grew up watching Disney (and having too many Minnie Mouse dolls), it was definitely a delight for me. Have you stayed in any of the three Hongkong Disney hotels? I'd love to hear your stories!